Light Rock Fishing, Hard Rock fishing, Fly, Lure and Bait fishing in Saltwater. Been out on a couple of LRF sessions recently, and learned a few things which has added another dimension to one of our venues. The first spot produces fish on the flood tide, normally there are a few School Bass and Polllock to be had and the odd Garfish is normally present though these are often seen but not caught. Once the tidal flow slows here the sport normally drops off which is around high tide. This is the signal to move to a second spot a five minute walk away. Things have changed at this second spot in the last couple of years since a breakwater was put in place and reversed the tidal flow here. The venue would fish on the flood before the breakwater was put in place but now it fishes on the ebb instead. This has also had the effect of creating a slack area where the fish hunt during the fiercest part of the run off which forces any baitfish into this slack area for the predators to prey on. We only just discovered this on the recent sessions and I made the most of it a couple of nights ago when I had a dozen schoolies to over a pound and several small Pollock. I had lots of taps and lost fish too. 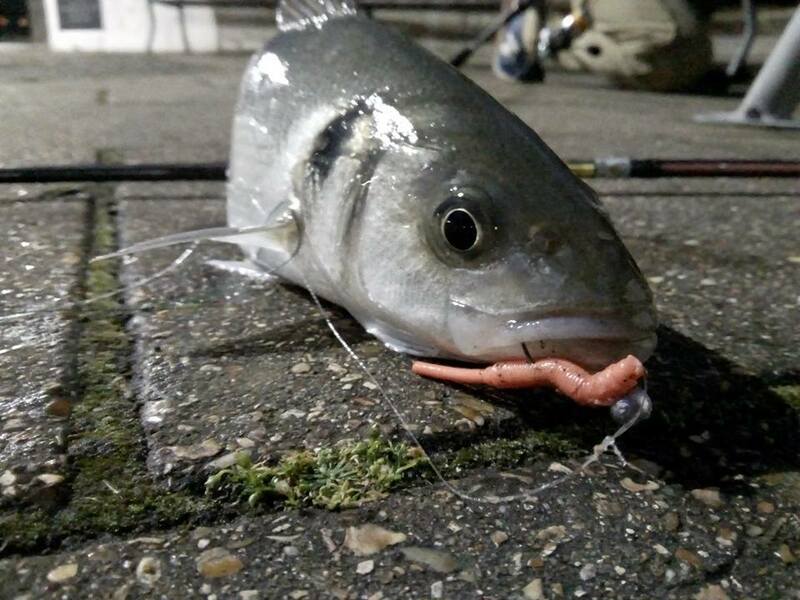 The good news is I will soon be stocking a range of soft lures from Crazy fish, a Spanish company that are making waves in the European Ultralight market and now pushing into the UK. The range is extensive and having used them myself I know they are very effective. 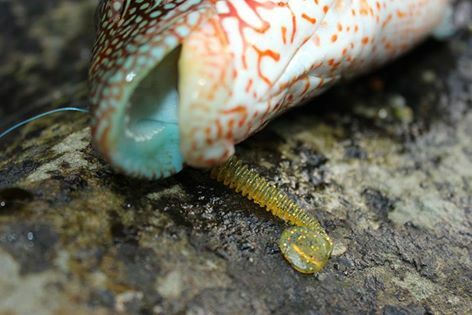 I prefer scented lures which is what the Crazy fish range is, carrying a Squid scent which not only attracts the fish but makes them hold on longer when they take the lure. In addition to this I am having a dedicated website built where I will be stocking the Crazy fish range as well as other Soft lures and accessories including weedless hooks, Jig heads, texas and dropshot weights and other terminal tackle items. Watch this space for the announcement of the launch which will be in the next few weeks. Until next time thanks for reading and tight lines. We've had some fabulous weather recently which has raised the sea temperatures enough to see a few fish start showing inshore. Following on from the last entry our best laid plans have had to change slightly due to a shocking lack of Sandeel availability preventing my friend and I pursuing any Ray fishing, yes we could use other baits but we would not have anywhere near the same results. Instead we have been out on Fly and Lure with reasonable success. Another LRF trip produced some nice Pollock to around the 2lb mark which was great fun on the ultralight gear and a strong tidal flow! The fish crash diving underneath the pontoon I was fishing from making the reel make that - zzzz - zzzzz - zzzz sound as they made a bid for freedom, and the rod at full curve, epic fun!! The next trip was on the fly and though it was a bit of a struggle I did manage a few Basslings plus a fish of about 1 3/4lb but at least it was a start! First proper Bass Lure session of the year again produced a few sporadic fish to about 3lb which was very satisfying and a promising start for the mark I fished which has been very unproductive for the last few years compared to when I first started fishing it and my friends and I were getting good numbers of Bass on most sessions. As you can see I have started using the action camera as much as possible to record some of the sessions. I find this a lot easier than trying to use a normal camera to take still photos while fishing and reduces the time the fish need to be out of the water. I can take an instant photo on the action cam if need be. Hopefully I will have enough to make a short film by the end of the season. So what's next? More fishing of course! hopefully plenty more fly and lure action when tides and weather permit. I feel like I have just woken from a long winters hibernation! It's been many months since I have actually fished in Saltwater and it's been a long cold and wet winter and I had reverted to some Freshwater fishing to pass the time. I grew tired and stale in a very short space of time and in the end it felt like I was just going through the motions, which indeed I was in an effort to keep doing some fishing of some kind. Yesterday signified the end of that period and I resolved to move on to some Saltwater fishing with the rising temperatures signalling the possibility of this. So Last evening I had a text from one of my fishing buddies enquiring if I fancied a bit of LRF at a local spot with one of our other friends. I jumped at the chance to make the change and off we went. The night was very still with zero wind and though slightly fresh it wasn't what you would call cold. We tried our first spot without any taps or enquiries of any kind from fish so we moved to another spot further along which is a small pontoon and we were all into fish virtually straight away! Our LRF fishing has always been very competitive which makes it even more fun and the banter flowed and fish were landed. Small Bass and Pollock were in residence and though the sport lasted only a short time it was a great re introduction to Saltwater and I really can't wait to get back out with my new found enthusiasm I am raring to hit the Salt hard this year! We have some Ray fishing planned for the next trip with the temperatures forecast to rise in the next few days we are hoping these large flat fish will come inshore at a shallow venue we like to fish for them. This mark produces mostly Small eye or Painted Rays and Spotted rays but there is also a chance of an Undulate and the odd Turbot. Following on from that I am hoping to get out on the Fly and of course some more Lure sessions. As the water temperature rises and the fish come closer inshore seeking the warmth of the warmer shallow water this will become viable. I can't wait and hopefully if plans are fulfilled this year there will be much more to write about here and I hope you enjoy reading about it. A small but welcome first fish of the year from Saltwater. Labels: Bass Fishing, light rock fishing, LRF, Soft plastics. Shop expansion- Fly and Lure! For the last couple of years I have been beavering away building up a small business selling High quality Saltwater and Predator fly tying materials which is beginning to pay off. The business is expanding as word gets around about the high quality products I sell as well as the outstanding service I pride myself on providing to my customers, many of which are returning time and again. I am now diversifying into the Lure side of things, as a passionate lure angler as well as fly fisherman this feels like a natural progression, and I am excited at the prospect of this expansion. I hope to obtain some prestigious accounts and establish relations with some of the premier suppliers and manufacturers in this field and provide the kind of service to Lure anglers as I have been to fly anglers. To begin with I have stocked my Ebay shop with a few items including two types of Ultralight soft plastics, jig heads and some braid while I build a dedicated website to accommodate a shop. If you would like to view the items with a view to making a purchase and support this venture then please visit the links below. All the above items are of a high quality that I have carefully sourced and tested myself. 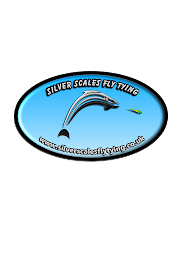 If you are in the UK and into your Ultralight fishing then please take a moment to visit the shop and test my service, I guarantee you won't be disappointed! In the unlikely event that you are I will happily give you your money back! Keep checking back to the shop from time to time as new items will be added, they will also be posted here as they arrive in stock. Thanks for reading, tight lines, and if you have any questions or need any help then please leave a comment. Labels: light rock fishing, LRF, lures., Soft plastics, Tackle reviews. I have recently re discovered my love of Saltwater fishing, that's not to say I fell out of love with it entirely but just got distracted by other things. My renewed enthusiasm has led to discovering some new marks, re acquainting myself with some old one's and actually managing to catch a few fish! I began with some bait fishing as it was still early in the year and lure and fly opportunities would not present themselves for a few more weeks. The target being Rays which have seen a resurgence in numbers the last few years. The first session produced some fish, however not the target species as the Dogfish were in proliferation that night! The next session produced the desired species and between my fishing partner and I we landed several Small eyed Rays. 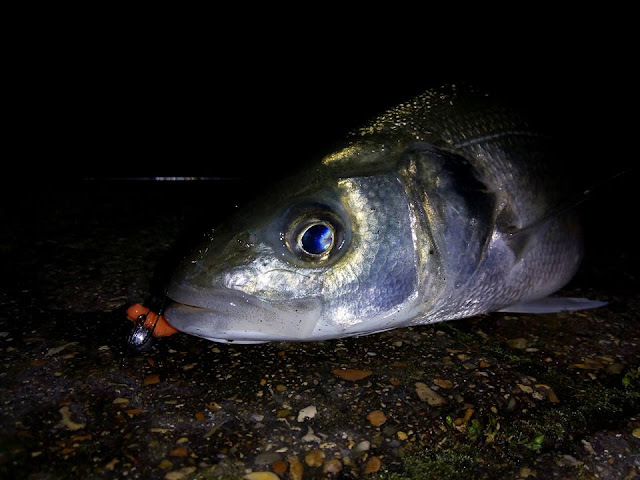 A few nights ago I managed to get out for a couple of hours Lure fishing for Wrasse at a new mark and from the first cast I was getting bites, and eventually hooked up with a Rock Donkey! So that brings us up to date really, there have been a few blank sessions in between but hopefully there won't be too many of those! Are you an avid fly angler and want to try your hand at some saltwater fly fishing? 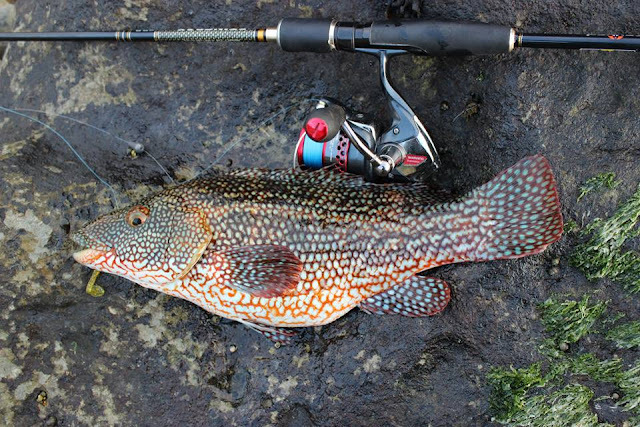 Maybe you've never picked up a fly rod in your life and are considering it for the first time with saltwater in mind? Whichever it is you are about to embark on one of the most thrilling types of angling that there is! Fly fishing in saltwater here in the UK isn't as big as it is in the United states or some other countries but it is an ever growing branch of the sport. For those lucky enough to realise the potential we have in our coastal waters there is some exciting sport to be had once the shoals are tracked down. Bass, Mackerel, Pollock, Garfish, Mullet and a few other species are all very catchable on the fly. The sport these fish provide on fly gear is in my opinion, unrivalled by any other type of fishing in the UK. I have spent many spring, summer and autumn evenings in pursuit of a variety of saltwater specimens and enjoyed some great sessions, and to be honest of all the different types of fishing I've enjoyed over the years, these are definitely the most memorable, and the type I still yearn after the most. So what is it about saltwater fly fishing that I hold in such high esteem? The simplicity is you, a rod, a reel and a box of flies. No bags, holdalls,chairs, bivvys, seat boxes, buckets and similar encumberments. You can walk free of burden for miles if necessary in search of your quarry without breaking a sweat. You may need a pair of waders and a waistcoat but these items are worn not carried, and therefore are part of your clothing. You are uncluttered by peripheral items. I rarely even carry a net as most of the time as I am wading and prefer to bring the fish to hand. A small camera and your box of flies and any spare bits such as forceps or spare leaders are carried in your waistcoat. I have tried various sling packs over the years but find it just encourages me to carry more unnecessary items. One other thing I always carry is a small bottle of water to drink, again this fits in one of my waistcoat pockets. Uncluttered refers to the terminal tackle, this is simply a fly line, a leader and a fly. There are no other fangled bits and bobs on the line, no weights, nothing. This has the added benefit of allowing a more direct contact with your quarry, there is nothing between you and the fish to detract from the fight and feeling that first pull as they hit your fly, a heart stopping moment if ever there was one! Of course the challenge is locating the fish in the first place, a subject best left for another article at this time, however location goes hand in hand with enjoying the scenery along the way as well as the ever changing moods of the ocean and the weather. You can never expect to catch from the coast and this is where the uncertainty comes in, you can add up all the clues as to where the fish might be, but there is no guarantee they will turn up when and where you expect them to. In my experience no two tidal events are ever the same, some times the fish will be there one tide and the next gone, leaving you guessing as to where to plan your next assault. The sheer thrill when you do get it right is unrivalled in fishing. The moment that line pulls tight as a fish takes your fly, the missed heart beat, the initial contact of setting the hook and the fraughtness of the ensuing fight, stuff dreams are made of!! Haven't been here for a while for various reasons, but as we are approaching a new season I thought I would try and revive things a bit ! So we are in the latter weeks of March now and though the winter hasn't been a really cold one it does seem to have dragged on. The sea temperature in the Solent is hovering around 7.5 degrees c at the moment and has been for a while. We've just had a couple of slightly warmer days with the air temperature pushing up to 13-14 degrees but the winds have had some kind of easterly in them. I think it's going to be a late arrival for the fish in any numbers this year unless things get a shift on, but in the meantime I have been busy preparing regardless, by tying flies and cleaning the gear and checking the lines. My old Orvis mid arbour reel has suffered from salt corrosion as a result of being dunked and though I always try and remember to wash all my gear down after every trip, sometimes it gets forgotten for any number of reasons ! So off to I went on the internet to hunt down a new reel and hopefully a bargain ! I managed to find this Lamson Konic, brand new and unused at just the right price, Lamson reels are fantastically engineered and functional reels, lightweight, with a tough anodised and polyurethane coated finish. As you can see it's already loaded with line and ready to go. I am actually going to be fishing mostly with a six weight outfit this year, the main reason for that is I want to focus as much attention as possible on Mullet. We normally get vast numbers of them here, and with Bass stocks being so critical it seems silly not to target the Mullet which are in abundance. We all know they aren't the easiest fish to catch and there is lot of mystery and legend surrounding them but like every species there is always a puzzle to be worked out until you hit on what it is they want. Anyway that's the plan and Bass will take the small trout flies that will be used for the Mullet so they will be a bonus by catch. There's normally quite a few other species that will turn up on the fly and lures here including Mackerel, Pollock and Garfish so hopefully i'll bump into some of these as well. I didn't in truth actually manage many saltwater trips last year on either the fly or lures and spent more time coarse fishing but that just doesn't fulfill my soul like the saltwater fishing does, the only fishing I intend to do in freshwater this year is on the fly when I can't get out on the coast due to adverse weather or water conditions. To that end I have invested in a little 3 weight outfit for the job. This little outfit consists of a 6ft Shakespeare Agility Rise, paired with a little Okuma reel and a Barrio small stream line. I am really looking forward to using this kit as the rod is like a noodle ! So those are the new toys that I will be playing with this year and also my plans, lets hope they all come to fruition and that some fish arrive in reasonable numbers to make it all viable ! Could there be a finer way to spend an evening? Waist deep in gently swelling water, the intoxicating smell of salt pervading your senses. With a Fly or Lure rod in your hand and a beautiful sunset for a backdrop. Bass blitzing on baitfish within casting distance, Gulls and Terns wheeling and diving overhead, joining in natures feast.....I think not!